The producers of Ong-Bak think they have the next Jackie Chan on their hands, and his name is Tony Jaa. Time will tell whether Jaa can fill those shoes, but Ong-Bak is a promising start. Of course Ong-Bak has a plot. Ting (Jaa) is a country rube in the big city of Bangkok. He has come to retrieve the severed head of the village’s Buddha statue, the Ong-Bak. It was stolen by a henchman sent to the provinces to buy an amulet from a villager. When the villager wouldn’t sell, the thug stole the church’s poor box and the head of their statue. In the big city Ting looks up “George,” who came from the village years ago and whose father thinks he’s studying at the monastery. George is no monk, and he only wants to take this hick’s money and dump him. But when he realizes that Ting is a great fighter, he sees Baht signs in his eyes. All he has to do to get a little more gambling money is promise Ting that he’ll lead him to the henchman with the Ong-Bak head, right after this one last fight (and this time he means it). Fortunately for us, this trickery also means there are plenty of excuses for fight scenes. “It had a good ratio of action to plot” is what I heard after the movie, and I agree. The first action set piece is a foot chase through a busy alley. It has all the humor you’d expect from Jackie Chan or Bruce Lee. 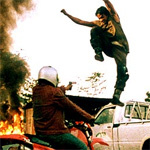 Jaa jumps between passengers on a tandem bike, through a loop of barbed wire, over a skillet of boiling oil, and then flips sideways between two panes of glass about ten inches apart. His friend holds off a pursuing mob by threatening them with a cleaver, and through this tense showdown wanders a little woman selling big knives. Soon thereafter, Jaa gets goaded into a bar fight, taking on three different challengers, one after another. Each opponent has a different style of fighting. The fights are all choreographed, photographed, and edited very clearly. It is as though Pinkaew is making an instructional video on how different forms of martial arts stack up against “Muay Thai,” which is Jaa’s form. The last of these forms is “fightin’ dirty.” Bottles are broken, furniture is thrown, at one point his opponent even tries to electrocute him. Through it all, fresh-faced and hard-bodied Jaa shows his amazing martial-arts chops. The last fight in the movie is a little more disturbing. Jackie Chan was always Mr. Nice Guy, and the recent wire-fu epics (Hero, House of Flying Daggers) are more about grace than gore. But Jaa pulls a few moves that are downright nasty. Granted, his opponent has doped himself so that he’s more animal than man, but these are the kind of cruel moves you just wouldn’t see in a Jackie Chan movie. I’m not complaining; I’m just warning parents that Ong-Bak is a little more serious than many Chan movies, and it’s PG-13 rating might be a little soft (NOTE: the IMDB lists Ong-Bak as being rated R “for sequences of strong violence, language, some drug use and sexuality,” but our print, shown in Denver in February 2005, distinctly carried a PG-13 screen after the film). So is Tony Jaa the next Jet Li, Jackie Chan, or Bruce Lee? I hope so because Jackie is showing his age and Jet won’t be far behind. But remember that both Jet and Jackie had long careers making B-movies in Hong Kong and China before they appeared on U.S. radars. They developed and matured, honing their acting skills in the process, so that by the time we saw them, they had already developed as actors and martial artists. Jaa is still pretty new to the movie business (the IMDB credits him with one previous film — he was a stunt double in Mortal Kombat 2 in 1997). In Ong-Bak, he doesn’t have an on-screen persona. He has no smirk, smile, or catchphrase that hints at a personality underneath. He’s an amazing, talented martial artist, but he doesn’t reveal any human charisma behind the moves. Pinkaew and Panna Rittikrai’s script and Pinkaew’s direction did a lot of Jaa’s acting for him. So it’s too soon to say for sure that Jaa is the next Chan. But Ong-Bak is a good start, and I for one am rooting for him.